What’s the point of owning a riding mower if it doesn’t actually mow the lawn like a boss? Don’t answer that; it was a rhetorical question. As the owner of a garden care agency, I have had my fair share of disappointing pruning experiences. With lawn mowers being the main culprit! While one mower couldn’t go beyond an acre, another failed to do anything aside from mulching. I had recently taken up a trimming job for a school field that was around an acre and a half in size, and my standard mowers weren’t up for the task. Luckily I had the Troy-Bilt Mustang 54 on standby, using which I could save my face. Why should you care? Because if you’re going to make a big investment, you might as well learn from the experiences of others. And in this review, I’ll describe mine. Troy-Bilt Zero Turn Reviews 2019: What sets the Mustang 54 apart from the rest? What can Troy-Bilt look to improve in the Mustang? When the Mustang first landed on my doorsteps, I wasn’t all that impressed. With its average 54 inch body of hard plastic and steel, I didn’t think it would last more than 1.5 acres before needing a refuel. But the product proved me wrong once I got done with the school job. And soon after, the Mustang steadily grew to be one of my favorites. Here are a few reasons I believe the Mustang would be just right for your mowing needs. For a riding mower, the deck is perhaps its most important selling point. And it is also as important as the engine when it comes to determining the amount of time spent and saved. The Mustang has a riding deck of 54 inches which happily allowed me to trim down 1.5 acres of the school field in under 40 minutes. And surprisingly I noticed that the Mustang with its larger trim area and a powerful Briggs engine was almost 20% faster than my other mowers. The other fantastic aspect of the deck is how accessory compatible it is. I love a good mulching experience like any other gardener, and thankfully Mustang is compatible with various mulch bags. As an added bonus, the grass clippings are evenly discharged from the chute that is built into the side for automatic collection. And guess what, you can even adjust the mulching kit while the mower is still running. Convenient, isn’t it? It is extremely rare for a 54 inches mower to have an engine that can cover a little over an average yard. But the Troy-Bilt Mustang delivers that and more. It has a minimum capacity of 2.5 acres, which is much larger than a medium-sized spread. This amazing power is a result of the 24-HP, 724cc Briggs & Stratton V-twin engine which Troy-Bilt so generously gave the Mustang. It helped me cover the field with much ease, all the while facing obstacles on the ground, without overlooking a single spot. But on the flip side, I discovered that although the weight is ideal for climbing, the engine was just not powerful enough for sloped terrains. Constant uphill acceleration left something to be desired. 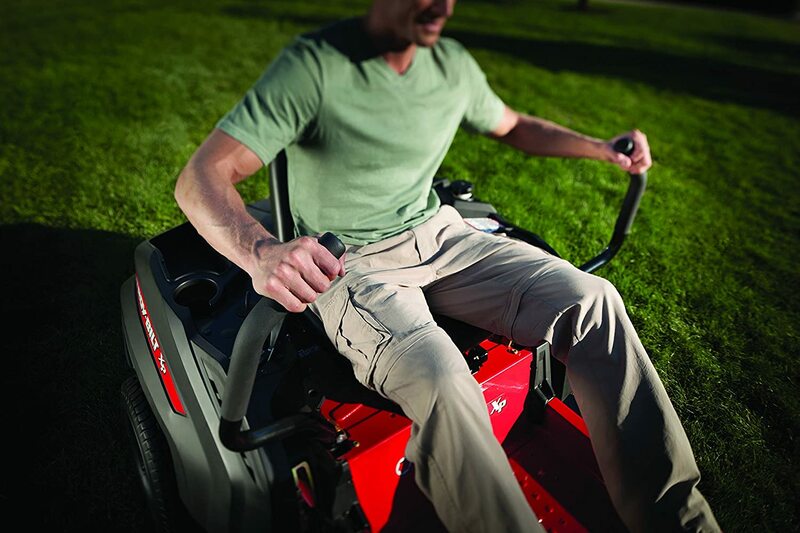 In my opinion, the zero turn feature is highly crucial for any riding mower to be able to trim around static obstacles without relying on push mowers. I was comfortably able to turn the mower at a zero radius so that I could trim out the tricky corners of the field. And it was all thanks to the hydraulic steering throttles that no part of the area remained untouched. Majority of gardening accidents happen when the mower does not switch off properly, or when the rider tries to disembark from a running mower. So with customer safety in mind, Troy-Bilt has come up with specific safety measures that kept me safe throughout the trimming session. 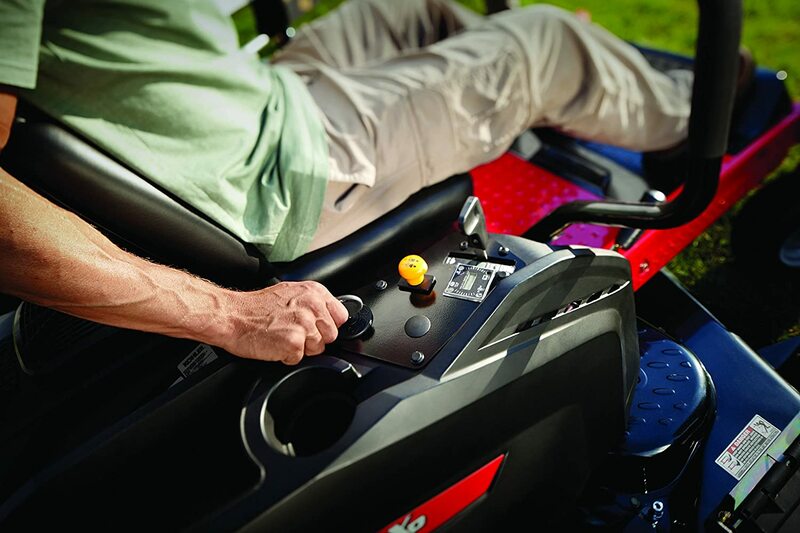 To operate the mower, you’ll have to be seated on the high-back seat for the engine to start. It is not key-operated, so while sitting with the steering-engaged, you will need to enter your personalized code. And upon leaving the seat, the mower will automatically stop. Powerful, time saving and mobile it may be, but the Mustang comes with its own variety of flaws. Here are the ones I noticed. The powerful Briggs is not powerful enough for constant uphill climbs. The front wheels are smooth, but way too smooth in my opinion. It practically glides, and this lack of traction is a flaw in my eyes. Zero turn feature gives high mobility for less control in wet terrain. Will I need to assemble the mower myself? The mower will mostly arrive at your front door assembled. All you need to do to do is attach the handles and the 2 sets of blades. Does the mower come with a mulching kit? No! But you can buy a mulching kit attachment for this mower separately. What’s impressive about this mower is how easily compatible it is with all types of mulching bags and kits. Is the Mustang suitable for my 2-acre backyard? 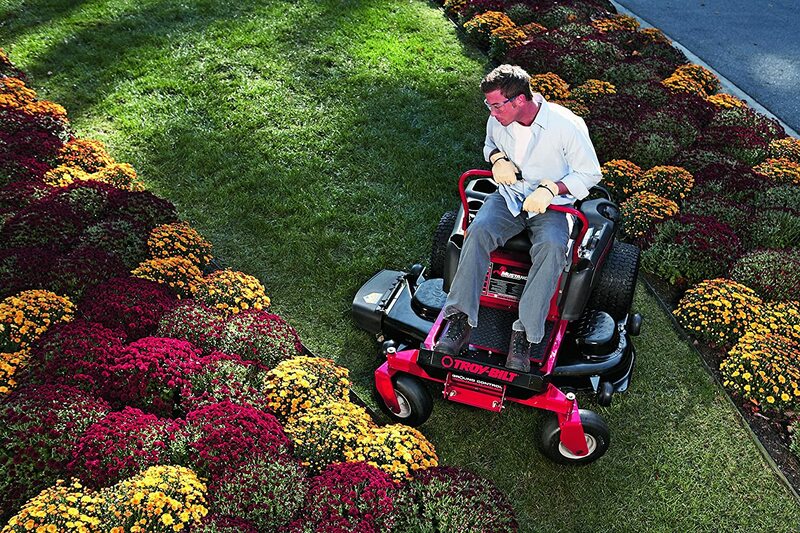 The Troy-Bilt Mustang will suit your 1 or 2 acre yard like a glove. It can breeze through a minimum of 2.5 acres and additionally its compact 54 inches size can fit through the most common backyard door. 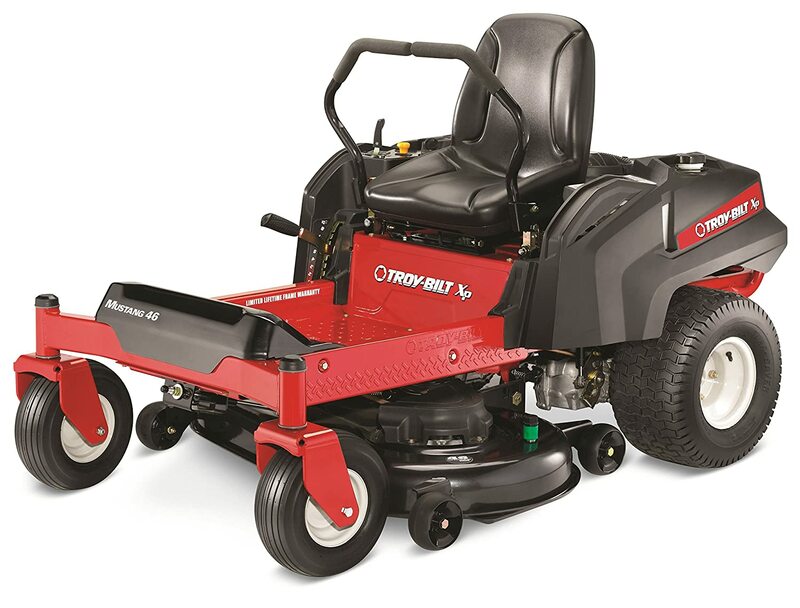 The Troy-Bilt Mustang 54 25HP Zero-Turn Mower may not be as cheap as the rest of its competitors in the market. But it is impossible to get such amazing features at a rate any lower than this. The mower effectively ticks all the checklists in my boxes, and I would not hesitate to recommend it to anyone. I hope my review today helped you form an informed opinion about the Mustang.